Researchers at Michigan Technological University look at use of solar microgrids for national security. They find that the US has the technological capability to install the 17 GW needed to fortify military bases. Engineer Joshua Pearce says solar, because of its decreasing costs, geographic accessibility and versatility, makes the most sense for powering microgrids. Distributed microgrid tech can secure the electrical grids at military bases to reduce the impact of cyberattacks, physical attacks from terrorists and natural disasters. Vulnerabilities in the power grid are one of the most prevalent national security threats. The technical community has called for building up the resiliency of the grid using distributed energy and microgrids for stabilization. Power production from multiple sources increases the difficulty of triggering cascading blackouts, and following an attack or natural disaster, microgrids can provide localized energy security. In a new paper published in Renewable and Sustainable Energy Reviews (DOI: 10.1016/j.rser.2017.04.094), an interdisciplinary team of engineering and energy policy experts from Michigan Technological University says the first step is to outfit military infrastructure with solar photovoltaic (PV)-powered microgrid systems. 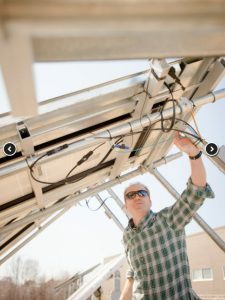 Their results found that the military needs 17 GW of PV to fortify domestic bases—the systems are technically feasible, within current contractors’ skill sets and economically favorable. Additionally, the paper’s lead author, Emily Prehoda, who is finishing her PhD in energy policy at Michigan Tech, says boosting bases’ energy independence supports local communities. The US military already has a renewable energy plan in place: 25 percent of energy production from renewable sources by 2025, but only 27 of the more than 400 domestic military sites either have fortified PV microgrids running now or have plans to do so, which makes the majority vulnerable to long-term power disruptions. Co-author Joshua Pearce says this is a great start but more is needed as most military backup systems rely on generators, which are also vulnerable to fuel supply disruption. The main historical threats to the electrical grid come from natural disasters like tornados, hurricanes and winter storms, which cost between $18 and $33 billion every year in power outages and US infrastructure damage. The threats that keep grid security experts up at night are deliberate attacks on the grid. These can either be physical attacks—like the 2013 sniper attack on a Silicon Valley substation, which cost $100 million and lasted 27 days —or computer hacking that causes cascading disruptions like in the Ukraine blackouts in 2016. In 2012, the US Department of Defense reported about 200 cyber incidents across critical infrastructure systems and nearly half targeted the electrical grid.During any event, energy generation and distribution unhitch like a lost caboose on a runaway train. 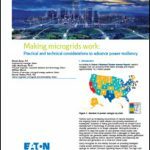 Microgrids provide flexibility and enable generation to persist even if distribution fails, maintaining performance for critical infrastructure while decreasing the chance of cascading failures. Solar, because of its decreasing costs and geographically distributed access to long-term solar “fuel”, makes the most sense for powering microgrids. Many military bases are located in regions with a history of power outages; microgrids could serve as back-ups to prevent service disruption during natural disasters and attacks. To quantify the technical impacts of distributed energy systems, the team looked at domestic military bases and their current electric loads. Then they reviewed where the military’s existing and planned PV-powered microgrids lined up with past grid failures as well as every state’s potential for solar power. 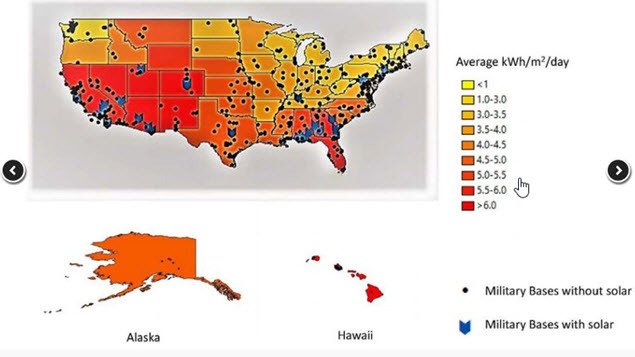 Solar has not reached full capacity across the US and many sites, including military bases, can take advantage of the technology to improve grid security. The team found that it would take 2,140 GW to supply all critical infrastructure in the US with 100 percent solar power and a hybrid microgrid system with storage provide protection against grid failure. The military alone would need 17 GW. To put that in perspective, the US has installed a total capacity of 22.7 GW of solar to date. The team then looked at the technical and economic feasibility of employing the top 20 contractors already working with the US Department of Defense to install more microgrids and performed a detailed case study of three companies, Lockheed Martin, Bechtel and General Electric, to gauge the extent of the technical skills and resources available. 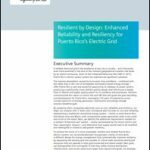 Given the results, the challenge to meet grid resiliency with microgrid deployment is feasible because the resources to install these systems already exist domestically. Prehoda also worked with her PhD adviser Chelsea Schelly, an associate professor of sociology at Michigan Tech, to assess policy needs. Despite the substantial national security risk, policy that addresses electrical grid failures has been minimal. Schelly explains that support for PV makes sense in terms of national security. In the paper, the team examined how securing top-priority military microgrids could trickle down into different levels of critical infrastructure. Technology designed and implemented at military bases could lead to similar microgrids for other government facilities, critical infrastructure like hospitals, industry and commercial systems as well as homes and neighborhoods. The first step is recognizing what it takes to outfit domestic military bases—and eventually military sites abroad—to combat power grid failure from natural disasters and terrorist attacks. This article was written by Allison Mills, a science and technology writer. It originally appeared on the Michigan Technological University website and was reposted with permission. Post your thoughts about use of solar microgrids for national security on our LinkedIn Group, Microgrid Knowledge.